The deputy CEO of the World Jewish Congress, Maram Stern, was in Turkey this week to take part in the re-opening ceremony of the Great Synagogue of Edirne, which was restored for $2.5 million and is the first synagogue to open in Turkey in two generations. Guest of honor at the ceremony was Turkey's Deputy Prime Minister Bülent Arinç. Turkey's Jewish community head, Ishak Ibrahimzadeh, attended the morning service conducted by Davud Azuz, who had led the last service at the synagogue 46 years ago. An estimated 250 people attended the service in the temple, which has a capacity of 1,200. "I would like to thank those who contributed," Azuz said, referring to the community effort to re-open the Great Synagogue. 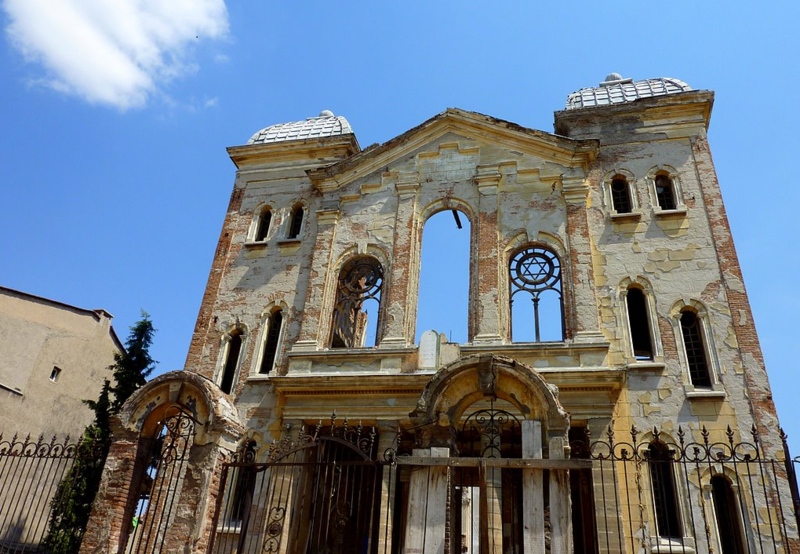 The Great Edirne Synagogue was built in 1905 by the order of Sultan Abdülhamid II to replace 13 separate synagogues destroyed by a huge fire that devastated the city. The building was designed by French architect France Depré. The synagogue opened in 1907 and served as a house of worship until 1983 by which time the city's Jewish community had dwindled to almost nothing. The building was later transferred to Edirne's Trakya University for cultural use, but due to criticism, was handed over to the General Directorate of Foundations in 1995. The synagogue's roof collapsed two years later. 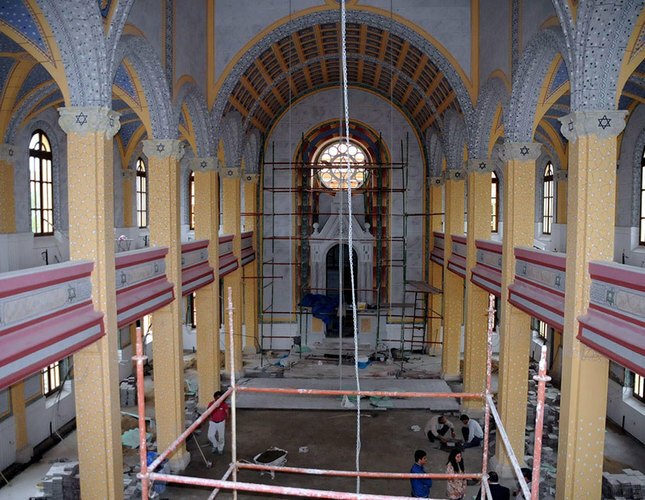 The synagogue was the subject of an outcry last year after Edirne Governor Dursun Sahin vowed to turn it into a museum rather than an active house of worship, which opened after four years of restoration work. Turkey's Jewish institutions such as schools and synagogues are behind security tunnels, shielded by steel blast protection. For centuries, Ottoman lands were a haven for Jews, welcoming Sephardim expelled in 1492 by Spain. Once here, they adopted new rituals, such as the melody of the azan in their prayers, while maintaining their traditions, most prominently the Judeo-Spanish dialect called Ladino. Census data shows Ladino was the mother tongue for 84 percent of Turkish Jews in 1927. Today only a few elderly speak the archaic form of Castilian Spanish, one of the world's endangered tongues. "This is not only Jewish but a part of Turkish and world heritage. It is proof that we have lived together and still do," said Güleryüz, author of a book on Edirne's Jews. "If we occasionally celebrate a wedding, we can keep it alive." 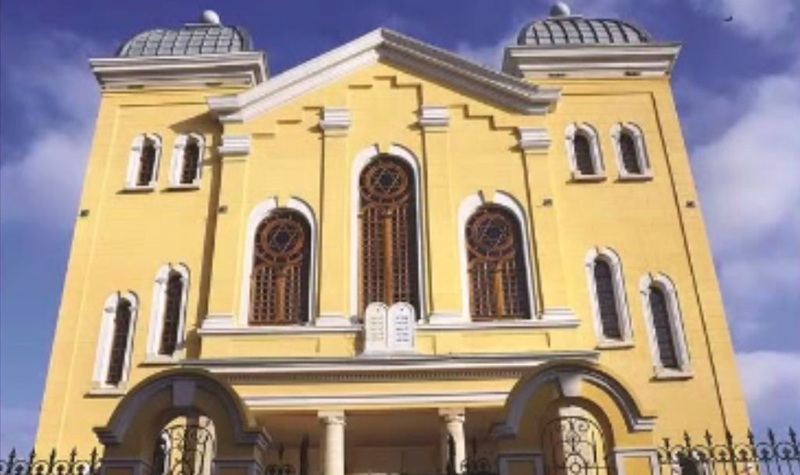 The synagogue's bright yellow exterior is a burst of light among the dilapidated wooden houses and concrete apartment blocks in Edirne's former Jewish quarter. Inside, painters painstakingly decorated the ceiling with thousands of stars, as beams of sunlight passed through a colonnade of neat arches. "It looks like its old self," said Mitrani, standing beside the polished marble of the ark bearing the Ten Commandments. Once the Balkans' largest Jewish temple, the Great Synagogue opened on the sultan's decree in 1909 to serve some 20,000 Jews. It was modelled on a temple in Vienna, later destroyed by the Nazis. Mitrani, who owns two supermarkets here, travels to Istanbul each week to join his wife and daughters for Shabbat. He planted a pine tree next to his mother's grave in the old cemetery, part of which has been occupied by a housing complex that uprooted graves. "I would have liked to have been buried in Edirne, next to my mother," Mitrani said. "Staying was always the easiest thing for me. I can't imagine the day I won't be here." he declassification of Israeli nuclear secrets is hardly surprising. But for those who support Israel, this Pentagon act is vindictive and dangerous."